3 books and a news pamphlet in one volume. 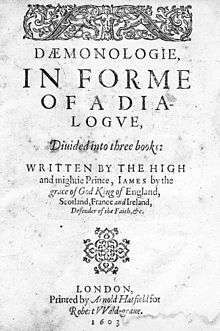 Daemonologie — in full Daemonologie, In Forme of a Dialogue, Divided into three Books: By the High and Mighty Prince, James &c. — was written and published in 1597 by King James VI of Scotland (later also James I of England) as a philosophical dissertation on contemporary necromancy and the historical relationships between the various methods of divination used from ancient Black magic. It included a study on demonology and the methods demons used to trouble men while touching on topics such as werewolves and vampires. It was a political yet theological statement to educate a misinformed populace on the history, practices and implications of sorcery and the reasons for persecuting a witch in a Christian society under the rule of canonical law. This book is believed to be one of the primary sources used by William Shakespeare in the production of Macbeth. Shakespeare attributed many quotes and rituals found within the book directly to the Weird Sisters, yet also attributed the Scottish themes and settings referenced from the trials which King James was involved. As detailed in his preface, the main sources of this work were that of historically confessed witches, judicial case history and the bible itself although he also amassed various dissertations on magical studies to expand his education on the relationships between infernal spirits and men. James generally sought to prove that the Devilish arts have always been yet still are but also explains the justification of a witch trial and the punishments which a practitioner of the dark arts merit. He also reasons scholastically what kinds of things are possible in the performance of these arts and the natural causes of the Devil's power with the use of philosophical reasoning. [A 1] King James sought to prove the existence of witchcraft to other Christians through biblical teachings. As such, his work is separated into three books based on the different arguments the philosophers discuss with citations of biblical scripture throughout the text. Newes from Scotland - declaring the damnable life and death of Dr. Fian, a notable sorcerer is a pamphlet originally printed in London in 1591 that details the infamous North Berwick witch trials in Scotland and the confessions given before the King. The initial and subsequent publications of Daemonologie included a previously published news pamphlet detailing the accounts of the North Berwick witch trials that involved King James himself as he acted as judge over the proceedings. The deputy bailiff to the kingdom of Scotland, David Seaton, had a servant named Geillis Duncan who, within a short period of time, was found to have miraculously helped any who were troubled or grieved with sickness or infirmity. [A 9] David Seaton examined her as a witch and obtained a confession that caused the apprehension of several others[A 10] later declared to be notorious witches. Agnis Tompson confessed before King James to have attempted his assassination using witchcraft on more than one occasion. The pamphlet details how she attempted these. She also participated in a sabbat during All Hallows' Eve[A 11] as her and others sacrificed a cat and sent it into the sea as they chanted in hopes of summoning a tempest to sink a fleet of ships accompanying James as he was arriving in the port of Leith from a trip to Norway. One ship was sunk from the storm containing gifts meant for the Queen of Scotland but the others including the ship transporting King James were unharmed. [A 12] Doctor Fian was deemed a notable sorcerer and was among many others that were apprehended in the trials. The pamphlet details their reasons for conducting sorcery, the methods used, how each of the witches were apprehended and the torture methods used in their punishments and death. The case of Doctor Fian follows his compact with Satan, a conflict he had with another witch who sabotaged an enchantment meant for her daughter,[A 13] his examinations during the trial, the torture he endured, his escape and subsequent execution. It has been noted that the themes taken from Daemonologie and King James' involvement in the North Berwick witch trials may have directly contributed to Shakespeare's work Macbeth. Evidence of this exists in the three witches use of ritual magic and direct quotes that directly relate to the testimony given from the witch trials described in the Newes of Scotland pamphlet. Macbeth had came into public enjoyment a few years after the publication Daemonologie and retains many of the same Scottish themes and settings. Daemonologie heavily inspired Matthew Hopkins in his work as a witch-finder between 1644 and 1646 in which an estimated 300 witches were tried and executed. In the year of Hopkins' death, 1647, he published The Discovery of Witches which directly cited Daemonologie as a source for creating methods in discovering a witch. ↑ Evans, G. Blakemore (1997). The Riverside Shakespeare (2 ed.). Boston [u.a. ]: Mifflin. p. 1356. ISBN 0-395-75490-9. ↑ King James. Daemonologie. A Critical Edition. In Modern English. 2016. ISBN 1-5329-6891-4. ↑ Hopkins, Matthew (1647). The Discovery of Witches. Query 10. ↑ Ferrier, J. F. (1854). Institutions of Metaphysic: The Theory of Knowing and Being. Encyclopedia Britanica Online, 2007. p. 46. King James. Daemonologie. A Critical Edition. In Modern English. 2016. ISBN 1-5329-6891-4. Daemonologie, The Gutenberg Project .